The hottest topic for the Cowboys during this free agency period is who will they bring in at safety? Jerry and Stephen Jones both made it clear that they would like to bring in one, if not two, safeties to upgrade the Cowboys secondary. Well, Tuesday the Cowboys made a safe decision in bringing S Gerald Sensabaugh. 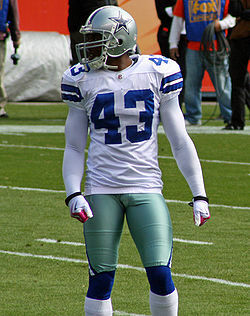 Sensabaugh had been with the Cowboys for the last two seasons, after spending four with Jacksonville. The Cowboys signed Sensabaugh to a one-year, $2.5 million contract. This is the third consecutive year that Sensabaugh has received a one-year contract. The Cowboys seem unwilling to lock Sensabaugh down for a long term contract. One can only assume it is because they feel every year they could upgrade the position. With safeties Dashon Goldson, Abram Elam, and Donte Whitner still available, you have to assume that this deal was done because Sensabaugh is accepting the right price. Estimates put the other safeties around the $4-5 million asking range. Sensabaugh brings familiarity with the organization and he had 5 interceptions last year. He has been solid, but not great. Sensabaugh, while not flashy, gets the job done. He has the ability to play either safety position and is good in run support. With his signing, the Cowboys could still bring in another veteran safety, or they can roll the dice with Church and Owusu-Ansah at one of the safety spots.